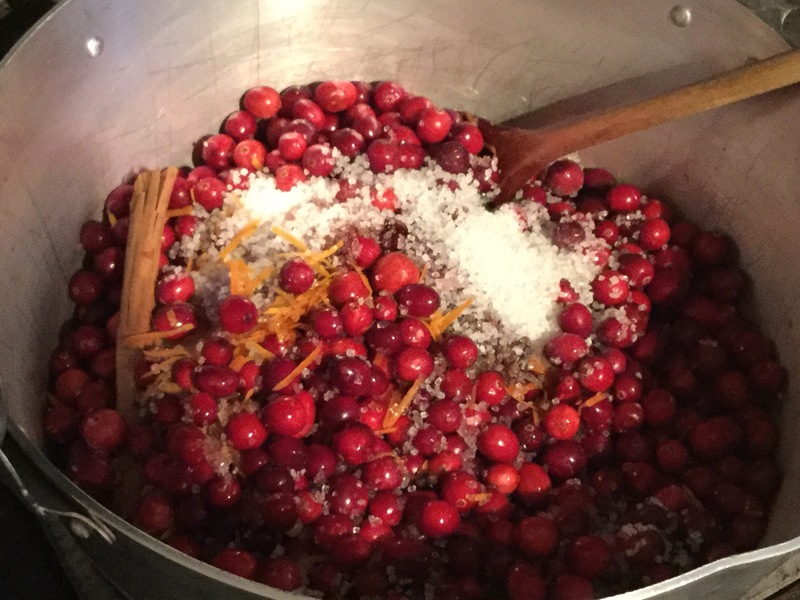 This week I have been making more cranberry and orange compôte and mincemeat to sell at The Skinners’ School Christmas Fayre and Farmers Market. If you want a cranberry sauce to go with your turkey or gammon that isn’t as sweet as many cranberry jellies sold, then try this one. It is made with a little sugar but the main flavour is cranberry. It would also go well with brie or a baked camembert. The mincemeat recipe I use has lime juice and zest to go with the dried fruit. This gives it a fresh zingy taste. It is suitable for vegetarians. £3.50 for a 320g jar of mincemeat. I have a table at The Skinners’ School Christmas Fayre and Farmers Market on Saturday 3 December 2016 on St Johns Road in Tunbridge Wells. If you would like to try some of my chutneys, jellies, cakes and biscuits before you buy, please come along between 11am and 2pm. I will also have Panforte, traditional Christmas cake and Christmas Puddings for sale along with gift boxes which can be made up with your choice of chutneys, jams, marmalades and jellies. I look forward to seeing you this weekend. PS Please bring cash with you as I don’t think my card payment machine will have arrived in time – sorry for the inconvenience! 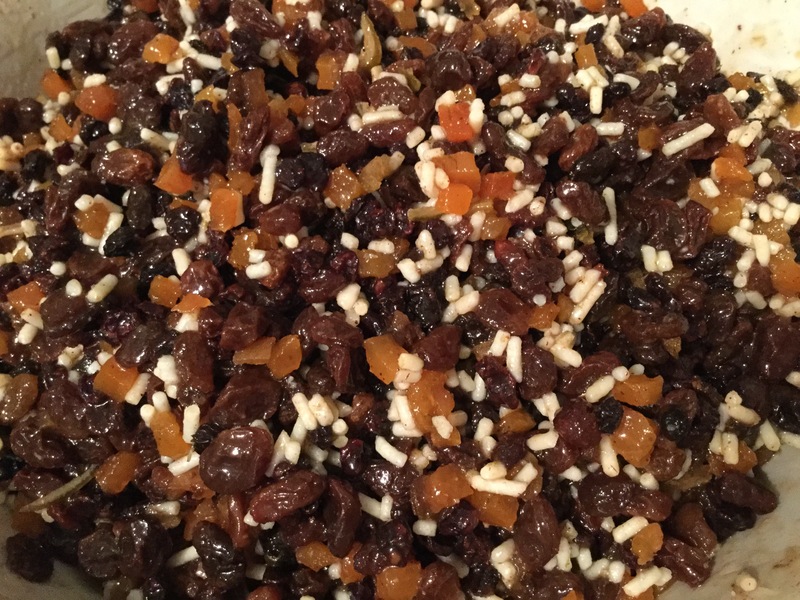 Stir up Sunday is the last Sunday before Advent and is the traditional day to make Christmas cakes or puddings so they have time to mature and the fruit can absorb the brandy (or rum, if you prefer). Over the years, I have varied the fruits I include in my cake but the basic recipe is still the old one my mother gave me many years ago. I chop the dried apricots, prunes, dates, figs, candied peel, cherries and stem ginger and leave them to soak in brandy with the raisins, currants and sultanas for at least 24 hours before adding to the cake mix. I also add freshly chopped nuts, grated nutmeg and ground spices to the flour. After baking, the cake is wrapped and stored in a tin until just before Christmas. I usually feed it a couple of times with a little more brandy which also helps to keep it moist. As well as the cake for our family, I can make additional cakes to order if you do not have the time. These can be round or square, in a variety of sizes from 4″ square to 12″ square, from 6″ round to 12″ round. Please contact me if you would like to order one. Prices start from £10 plus delivery. On Wednesday 16 November, I will have a stall at the Nizels Golf and Country Club ‘Christmas Beauty Evening’, near Hildenborough in Kent. I am planning to take along a selection of preserves, biscuits, cakes and savoury nibbles which can be given as Christmas gifts and many will be available for tasting on the night. I will also be taking orders if you would rather wait until nearer Christmas to receive your foods. I am also hoping to sell my foods at other locations in the run up to Christmas so watch this space for further information. Email me at toobusytomake@btinternet.com or call me on 07787 963896 if you want to place an order or find out more. I have made our Christmas puddings for a number of years. I have tried a few different recipes but prefer this one as it is less sweet, having no additional sugar. It contains raisins, sultanas, currants, candied peel, cherries and flaked almonds. Vegetable suet and breadcrumbs are mixed in, along with eggs, brandy, Guinness and spices and the puddings are steamed for hours. I will now mature them in a cool dark place until Christmas Day. We only eat one pudding each year but they last so well that I make and store one for the following year. This year I have made 4 additional small puddings which are available to buy. They each weigh 600g and come in a reusable pot. They will need to be steamed for another 1 ½ – 2 hours and then you can enjoy it with your favourite accompaniment whether it is brandy butter, rum sauce or custard! Each pudding will provide 8-10 servings and costs £10.00. If you would like to buy one, please email me at toobusytomake@btinternet.com.